❤️ Top 15 Free Web Hosting Sites - ✅ Does 000webhost is the Best? If you’re into an online business, then it’s is probably a known fact to you that running a business can really be quite expensive. Be it setting up a website or maintaining it or updating its design or layout from time to time, each end every measure you take to keep the presence of your business online comes with its own cost and can sometimes take a toll on your pocket too. Therefore, it becomes necessary to minimize the expenditure in any way that seems possible. And it is here that the importance of free web hosting websites come into existence. Web hosting is one such area where the cost of hosting packages and plans can really be enough to worry you. But, what if you can just have your project up and running on the internet such as Private Blog Network (PBN) which really no traffic at all and any small hosting is needed, without having to pay a single penny for it or a very meager amount maximum! Yes, there are various free web hosting sites that can be of great help to you if you’re one of those who is interested in trying a different web hosting company for free or a beginner who’s about to get started with his brand new website. Let’s have a look at some of the most popular web hosting sites that are absolutely free or nearly free. List of 15 Best Free Web Hosting – Create your First website Now! WebFreeHosting.net – Free PHP Mysql Web Hosting with MySql support. Known as a ‘green’ website hosting company, it believes in an idea that tells a user to not to opt for paying for website hosting, if that person doesn’t want to. And, as a result of this belief, it has introduced free web hosting plan where you’ll get 1 GB of storage and 5 GB of monthly traffic. When it comes to Joomla or WordPress, it offers one-click installers for its free plans. Plus, there is no worry about feature ads on your website when opting for its free web hosting plan, WebFreeHosting.net doesn’t force ads on websites. 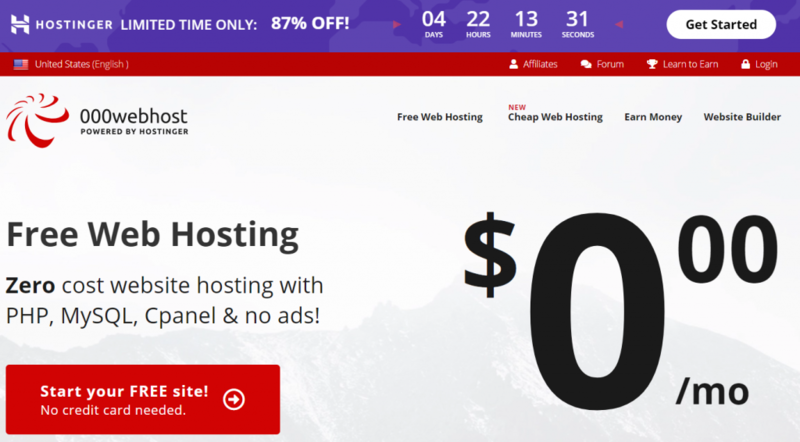 Easy Hosting & Web Tools from Bravenet.com. Starting in the year of 1997, Bravenet.com is a company with both experience and reputation that also offer a free web hosting plan with unlimited monthly traffic and unlimited disk space. Coming with a platform for email marketing, the email marketing tool offered by this free web hosting company is meant to help the users in building a contact list and designing messages with customized solutions or templates. Freehosting.com offer Instant activation with PHP/MySQL/cPanel. Offering 10 GB storage space and 250 GB monthly traffic bandwidth, this web hosting site comes with a large and active community. It is also one of the biggest hitters if you consider its bandwidth capacity. The number of email account offered by this free hosting website is one and it also free subdomains to those users who do not have a domain name already. It is also one of the few free web hosting sites that actively promotes using hosting service for backing up the important files or sites. 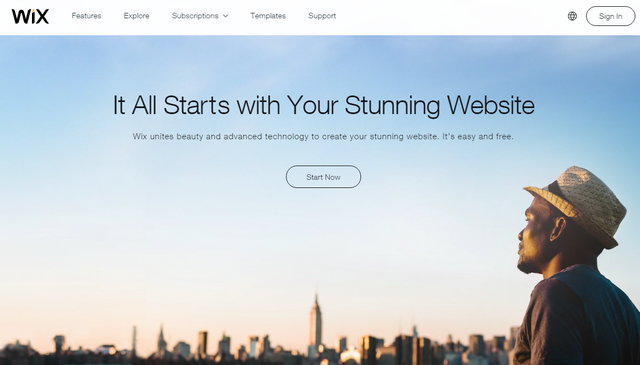 Create a free website with Wix.com, no coding skills needed. This particular browser based free web hosting site can be ideal for those who prefer to opt for a simple and easy drag & drop option for creating their basic business website. Providing 500MB storage and 500MB monthly bandwidth for free, it lets one avail features like domain, eCommerce, and email, once the person upgrades to the non-free web hosting plan offered by Wix.com. This free web hosting site is particularly known for its robust features and easy setup procedures. This web hosting website doesn’t only offer free hosting plans to its users but also follows a no ads showing principle, apart from its branding on the footer section of your website page. 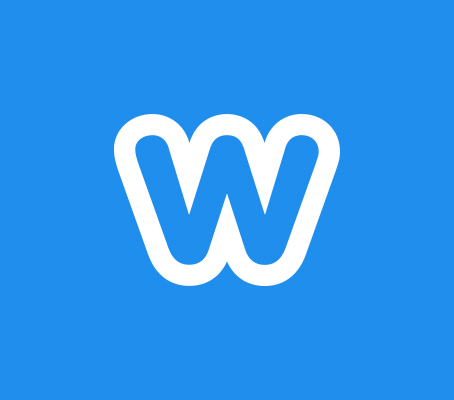 Offering unlimited bandwidth with 500 MB disk space, the free plans that Weebly.com comes with, integrate perfectly with its amazing platform. The temples that this free web hosting website has to offer, are not only modern but also well-polished. Coming with a bandwidth as well as disk storage space of 1000 GB, uhostfull.com is free web hosting company that offers full support to platforms like Zen Cart, Mambo, WordPress, osCommerce, phpBB etc. though it does have a paid version to offer too, but it is more popular for its free hosting service. It doesn’t come with any limitations for the file size when you upload files on your website. In case you’re looking for a simple website set-up process and quick hosting option, then this free web hosting site can be a wise choice. In business for more than 15 years now, UltraWebHosting.com offers various types of web hosting plans, a free plan being one of them. Providing a 124×7 quick user support, it offers a monthly traffic of 10 GB to a free hosting service holder. It not only supports one domain but also provides one email account too. They also offer various hosting options such as WordPress, VPS, Shared, dedicated, Reseller etc. Powered by a host named SingleHop, x10Hosting.com is known for offering unlimited bandwidth every month as well as unlimited disk space. Being quite an experienced web hosting service, the free plans that they offer generally come with SSD hard drives. Providing the users with full compatibility with MySQL, PHP, and cPanel, this free web hosting site also offers great support through its huge community of 750000 and more members. When it comes to FreeWebHostingArea.com, it simply allows its users to have their free account forever, as long as they visit their dashboards at least once in every month. Coming with unlimited bandwidth and 1.5 GB of storage space, this free web hosting site is more suitable for the tech-savvy people than nontechnical webmasters, giving them opportunities to experiment and explore the hosting platform. Though this free web hosting website is relatively new in the market, but the features that it offers are more than satisfactory. Just as the name suggests, it offers 5 GB of disk space and a monthly bandwidth of 20 GB. Focusing on cutting-edge security and technology, this web hosting site provides PHP scripting as well as three MySQL databases. It also provides quality user support through its forum and offers an upgrade option to its Pro version for those who are interested in getting expert support on phone. This particular web hosting site comes with various hosting plans of different tariffs with unique names for each, such as Supernatural, Wildhoney, Lovebeat etc. It’s hosting plan called the Chocolate is a free plan where it offers the users around 250 MB of disk space and 6 GB bandwidth. Coming with MySQL and PHP compatibility, it guarantees 99.9% server uptime. Though the storage capacity offered by it may seem small, but if you compare it with the ad-free environment and the 24X7 user support that it provides, you’ll know why it is so popular. Free Web Hosting No Ads offers free hosting without advertisement. 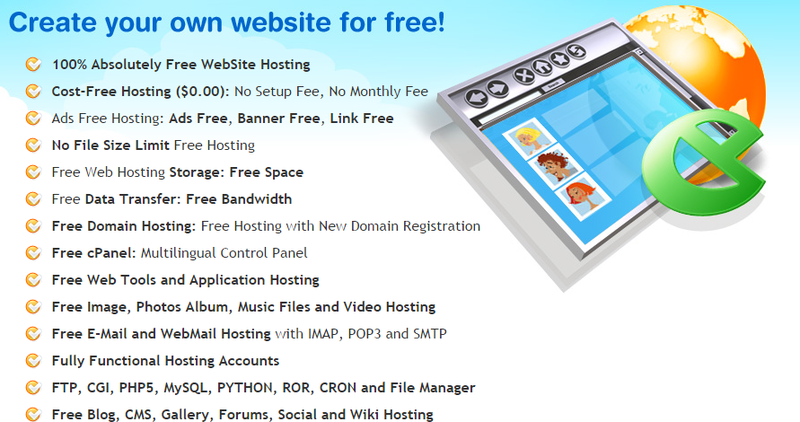 With 20 GB disk space and 200 GB monthly bandwidth, FreeHostingNoAds.net offers a nice free web hosting plan. Working as a partner of iPage, anyone can easily sign up with them to use its amazing hosting service for free. It offers a script installer, a control panel and website builder to the users of its free web hosting plan. Supporting both a domain and one email account, it also sends a mail once within 6 months to inform you about its other affiliated programs. byet.host is a part of a hosting service provider company named Byet Internet. Having a record of hosting more than a million web sites, this web hosting service offers 5 email accounts. byet.host also fully compatible with PHP and My SQL. If you are looking for free web hosting service with green credentials, then AwardSpace.com can be the right one for you. Using the free hosting service for growing its customer base, AwardSpace.com has an experience of over 10 years in the field of web hosting. Apart from offering a disk space of 1 GB and 5 GB bandwidth, it also offers one database, spam filter, and one email account. In case any issue arises, it also offers the users with 24×7 support and online documentation. 000webhost.com offer Free Web Hosting with PHP, MySQL, free Website Builder, cPanel and no ads. Almost unlimited free website hosting and free domain hosting. This web hosting site is known to provide its free service since the year 2007 and has been successful in impressing millions of users all over the world. Ideal for both small and medium projects, this free web hosting site has amazing website management and web building features. Including 1.5 GB of disk space, 000Webhost offers five email accounts and 100 GB of bandwidth each month. Here, you can not only get weekly backups and 99percent of provable uptime; but also full PHP and MySQL support. Though the free web hosting sites do come with few limitations and may not be ideal for all kind of businesses, but if you consider the benefits that they have to offer, well, then, yes, they can be ideal options for an easy and quick savings in the area of web hosting. After I test and use, I would suggest you sign up the free web hosting on the 000webhost.com, And I would like you share your experience on it!